There's nothing quite so beautiful and majestic as the ocean. Whether you love taking in the salt, sand, and waves while walking down the beach or you enjoy all the coast has to offer from afar, our new ocean-inspired ideas will get you itching for a trip to the seaside. 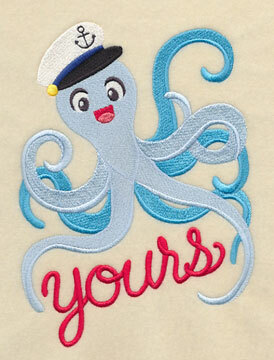 Seaside blossoms intertwine with anchors, underwater creatures flash a cheeky grin, and elegant sea life await in our new collection of seaworthy designs. 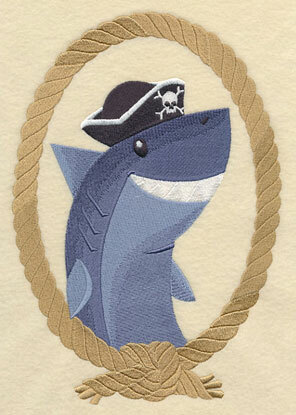 Try our new ideas as a beachy addition to your tote bags, beach towels, and bath towels, too. Stitch a framed piece with your favorite sea-theme quote, and decorate your beachfront getaway with a starfish throw pillow. 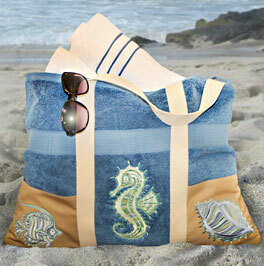 Transform a simple beach towel into this season's must-have tote with a little embroidery and a lot of creativity. 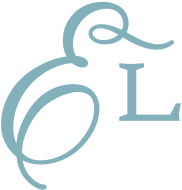 Click here for free project instructions! 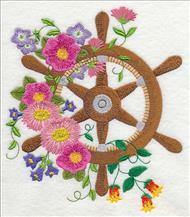 Stunning oceanside flowers in full bloom lend a delicate, elegant touch to traditional nautical motifs. The sweet design showcases the natural colors found by the water with its beautiful depictions of seaside centauries, morning glories, bluebells and yellow horned poppies. 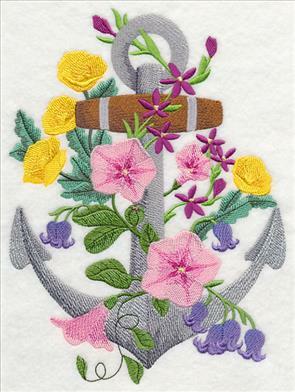 6.90" x 9.29" and 5.76" x 7.75" and 4.85" x 6.53"
A breathtaking arrangement of beach roses, seaside geraniums, gentian, and daisies weaves its way through a ship's wheel. Stitch the striking floral display onto towels, wall hangings, and tote bags to add a touch of coastal elegance to your home. 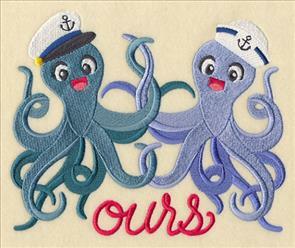 6.71" x 7.80" and 5.85" x 6.79" and 4.86" x 5.64"
Use these adorable sea creatures as fun and playful additions to your embroidery projects (we love the idea of using them on quilt blocks, towels, or framed as a collection). 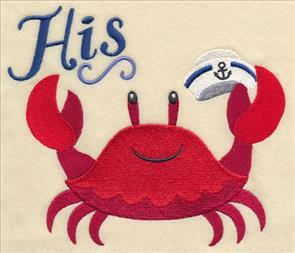 Each of the kid-friendly designs gives a hint to the underwater home, whether through a pirate's patch or a sailor's cap, and is a too-cute way to take a mini trip to the seaside. 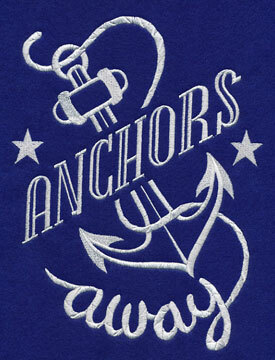 6.90" x 9.79" and 5.49" x 7.79"
6.89" x 9.93" and 5.41" x 7.79"
4.77" x 6.87" and 2.70" x 3.89"
A loop of mariner's rope gives the underwater critters extra beachy fun and makes up the frame for their cameo look. 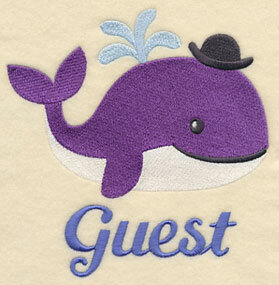 The bright, bold colors of the creatures against the neutral rope gives the spectacular designs an eye-catching appeal. 6.90" x 9.94" and 5.41" x 7.79"
6.90" x 9.94" and 5.42" x 7.81"
4.77" x 6.87" and 2.68" x 3.86"
Pair the showstopping cameos in groups of two, like the dolphin and whale designs below, or create the entire collection for a beautiful set of beach-ready projects. 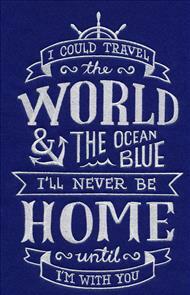 Add them to a tote bag for your next beach day, a pair of tea towels, or a set of framed pieces for your home. 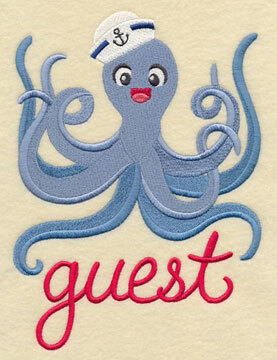 These creative critters will have you clamoring for the beach in no time! Pick your favorites by using the links above, or get all of the cameos in a design pack. 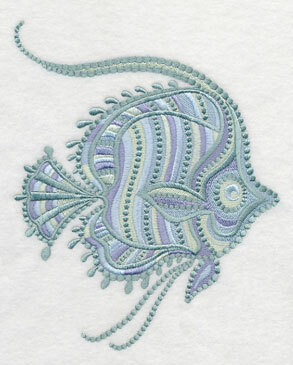 Delicate pastels and unique stitches combine to create this set of ethereal sea life designs. The varying layers of texture and color give the ornate coastal creations an impressive look that's ideal for adorning pillows, placemats for your patio, and bath decor. 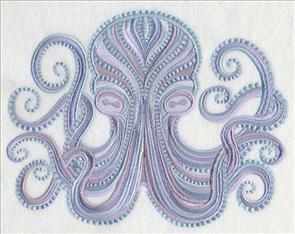 6.91" x 9.23" and 5.84" x 7.81" and 4.87" x 6.51"
The exquisite octopus and charming seahorse pictured below are an eye-catching way to celebrate the ocean in your decor. Beach-lovers won't be able to get enough of the set of majestic sea creatures, especially when displayed as a collection. 6.82" x 11.75" and 5.46" x 9.40"
4.57" x 7.80" and 4.03" x 6.88"
Finish off your ocean life collection with a beautiful likeness of a beach-ready sand dollar. 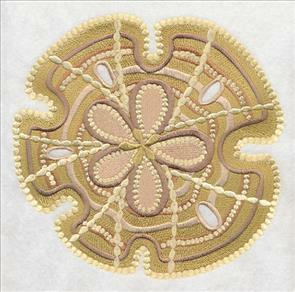 The stitches and colors mimic the natural curves and lines found on a keyhole sand dollar. 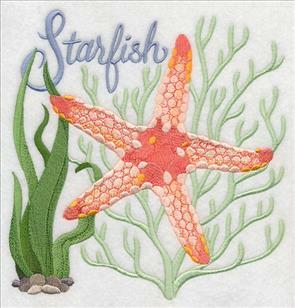 7.80" x 7.53" and 7.15" x 6.90" and 6.06" x 5.85" and 5.04" x 4.86"
Add depth and texture to your embroidery projects by using a variety of stitches, like those shown on the starfish and seashell designs below. 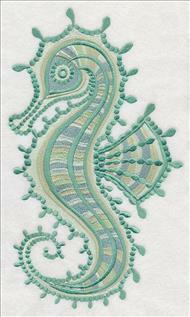 Soft color choices and elegant lettering give the intricate ocean-theme designs a sophisticated and graceful appearance. 7.61" x 7.79" and 6.89" x 7.05"
7.62" x 7.79" and 6.87" x 7.03"
5.88" x 6.00" and 4.86" x 4.96"
Not only are the colors in this nautical design vibrant and eye-catching, but the trio also captures the adventurous spirit of the open seas. 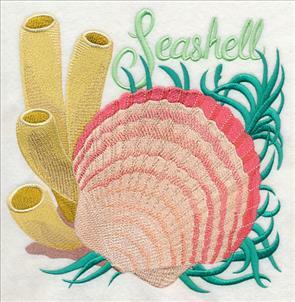 Use the larger size to adorn your new favorite beach towel; smaller options make the perfect addition to t-shirts or beach bags. 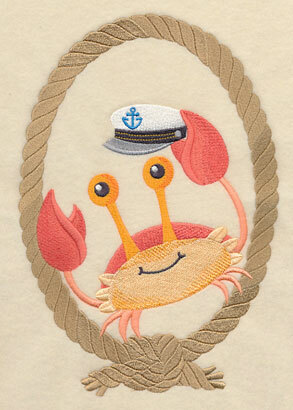 11.75" x 4.92" and 9.40" x 3.94" and 7.80" x 3.27" and 6.86" x 2.87"
Quick-to-stitch chalkboard art is a fantastic way to add ocean flair to your embroidery projects. 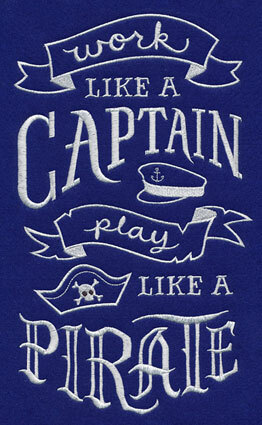 The clever one-color quotes will transform any pillow, tote bag, or tea towel into a seaworthy affair. 6.85" x 11.42" and 5.65" x 9.41"
6.85" x 10.86" and 5.85" x 9.27"
4.94" x 7.83" and 4.33" x 6.86"
Traditionally used to describe the action of bringing an anchor aboard a ship before departure, "Anchors Aweigh" is also the title of the fight song of the US Naval Academy and is strongly associated with the US Navy overall. 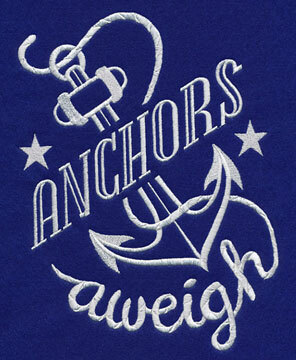 We're offering two beautiful designs honoring this phrase -- the original version and its more common variation. 6.85" x 8.87" and 5.85" x 7.58"
6.85" x 9.02" and 5.85" x 7.72"
4.85" x 6.40" and 2.94" x 3.87"
Brighten up a pair of matching bath towels with "his" and "hers" ocean-theme designs. 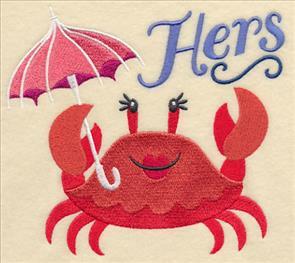 Each of the crabs is distinctly different: "his" offers vibrant colors and a sailor's hat; "hers" shows off eyelashes, red lips, and a pink-hued umbrella. 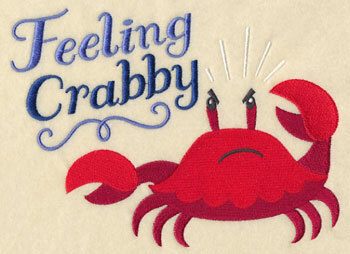 6.55" x 5.85" and 5.44" x 4.85" and 3.88" x 3.45"
Continue the crab motif with a cute and creative "Feeling Crabby" quote with matching character. 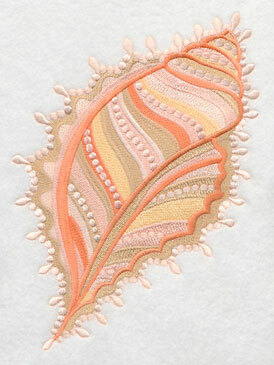 The clever design would be a fantastic addition to a throw pillow, shirt, or as a framed piece. 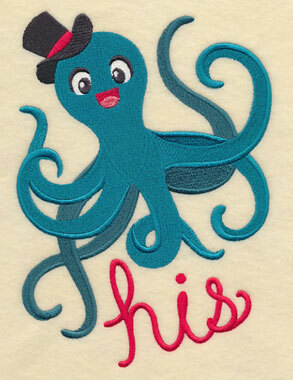 8.09" x 5.86" and 6.71" x 4.86" and 3.87" x 2.80"
A charming pair of joyful "his" and "hers" octopi are a lively addition to any embroidery project, but especially on a set of bath towels. 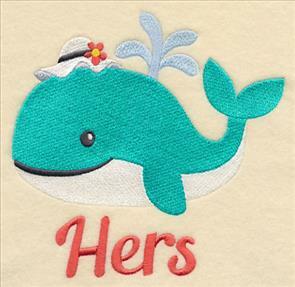 The vibrant colors and adorable details in the beachy design make it a must-have. 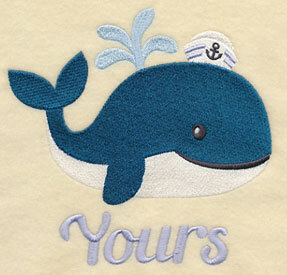 5.69" x 8.07" and 4.71" x 6.69" and 2.75" x 3.88"
Add "ours" and "yours" to a bath towel set with these adorable designs. 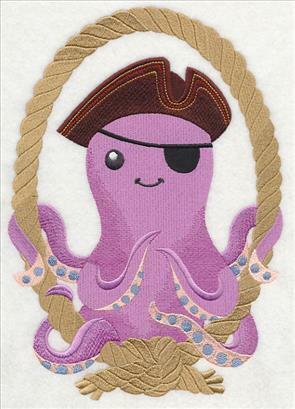 Each of the octopi are given different maritime accents to set them apart, such as captain's hats, pirate gear, or a sailor's cap. 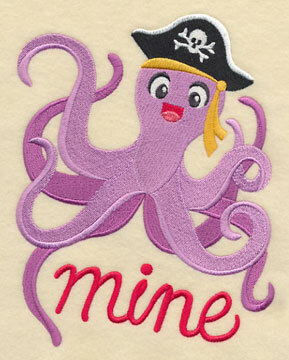 5.73" x 7.83" and 4.76" x 6.49" and 2.79" x 3.80"
Finish off the octopus theme with a "mine" and "guest" addition to the collection. 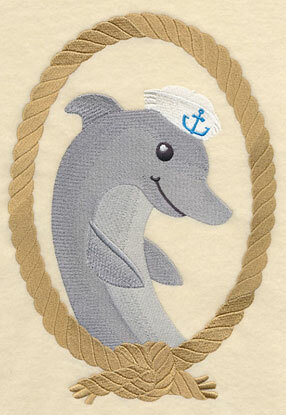 We love using the designs on bath towels for wedding gifts, anniversary presents, and everyday decorations. 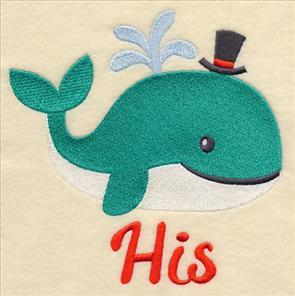 5.80" x 7.81" and 4.81" x 6.47" and 2.81" x 3.78"
This pair of "his" and "hers" whale designs are filled to the brim with personality and playfulness. 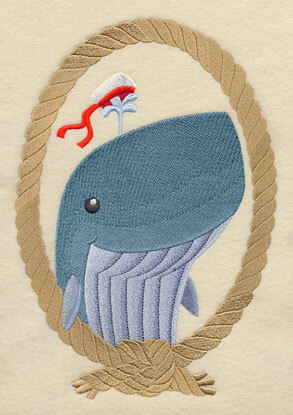 A tall top hat and a beautiful bonnet set the two whales apart. 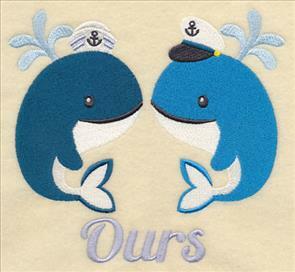 5.87" x 5.85" and 4.86" x 4.85" and 3.85" x 3.84"
Stitch these coordinating "ours" and "yours" designs to continue the underwater theme. 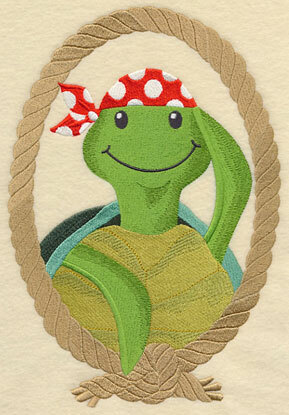 The cheerful characters are an excellent choice for adorning towels or robes in your bathroom. 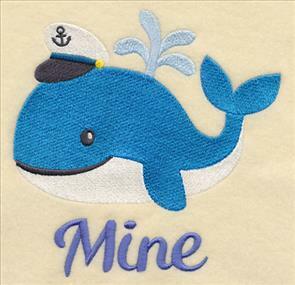 5.92" x 5.86" and 4.90" x 4.85" and 3.85" x 3.81"
Complete a set with a pair of "mine" and "guest" whales. 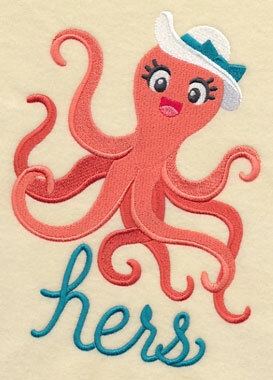 The sweet designs feature bright colors and a lighthearted approach that will bring a friendly feel to your embroidery projects. 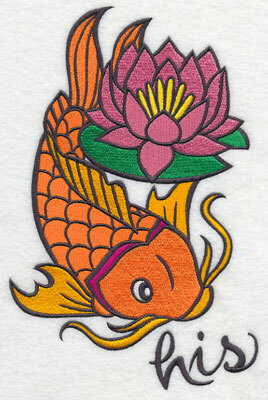 5.85" x 6.06" and 4.85" x 5.03" and 3.72" x 3.86"
In traditional Asian culture, koi fish hold great importance thanks to the legend of how a koi can transform into a dragon. 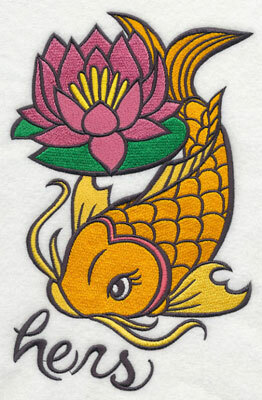 We let their cultural influence inspire our "his" and "hers" designs: each shows a koi paired with a gorgeous lotus flower. 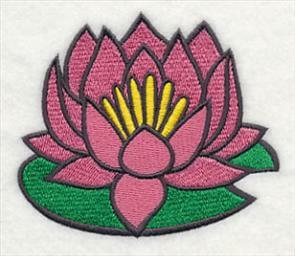 5.86" x 9.03" and 4.45" x 6.85" and 2.52" x 3.87"
A singular lotus flower makes a delightful complement to the above koi fish designs. 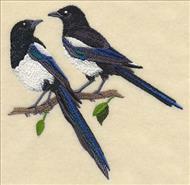 Stitch this beautiful design on a hand towel to complete a towel set. 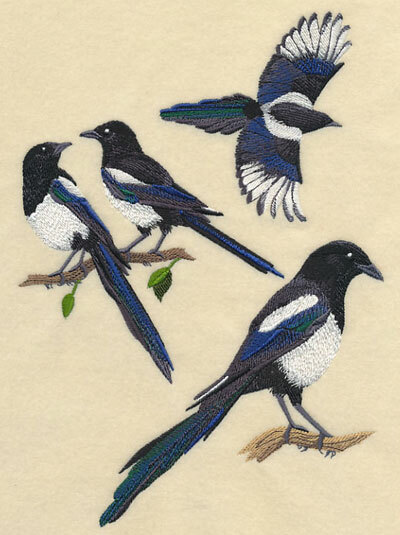 3.86" x 3.31" and 3.00" x 2.57"
Mary wrote in to say that a collage of Alaskan magpies would be a most-welcome addition to her embroidery collection -- and we listened! The strong and elegant bird is shown in three separate forms: flying, perched on its favorite branch, and paired with a friend. Thanks, Mary, for your request! 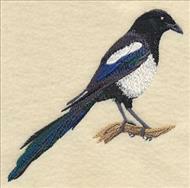 6.88" x 9.74" and 5.48" x 7.76" and 4.85" x 6.87"
Each of the majestic magpie depictions is available to create on its own, too. 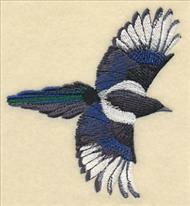 The beautiful bird would make a fantastic collection of towels, placemats, or set of scatter pillows. 4.22" x 4.35" and 3.73" x 3.86"